At one time there was a severe famine in Bihar. 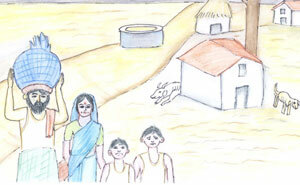 A family consisting of father, mother and two children started from Bihar to find livelihood elsewhere. 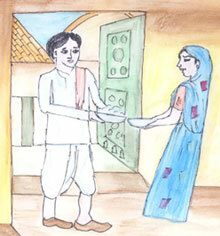 The father of the family being responsible to feed this family underwent many difficulties and hardships. He even starved himself on some occasions and because of this frequent starvation, he died after sometime. The mother having lost her husband, suffered from loneliness. She had to bear the burden of keeping the family alive in this wide world. She went begging from house to house for food and if she got some and if it was not enough, she starved. But she let her children eat. In course of time, she became so debilitated and frail that she found it difficult to walk from house to house. Begging from door to door was very hard for her. Her sons felt very sorry for her. As she listened to the words of her son, her heart melted. She felt very miserable that she had to send her son to beg for food. No mother wants her child to become a beggar. But the boy insisted and the mother very reluctantly consented. From that day the little boy was begging for food and giving it to his mother and the little brother and he himself would starve. After some days, he felt he could not walk and go out for begging. 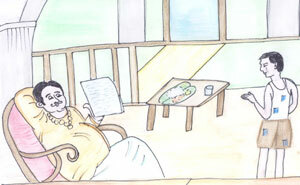 He went to a house and found the master of the house reading a newspaper sitting on an easy chair. In a feeble voice, he asked the master for food. The master replied that it would be useless to give him alms and said that he would give him food on a leaf. The boy, out of weakness, fainted. After uttering those last words, he passed away. We do not now find this kind of love, this intimate love existing between the members of a family. Here we find that the head of the family starved himself to death for the sake of his family. The mother starved herself for the sake of her children and the son starved and killed himself to save his mother from begging. Look at this example of affection that bound them together as father, mother and child. They look like the Holy Trinity. Therefore, each member of the family must discharge his own responsibility.